Champ's evil prototype has been unleashed and from out of a sudden, a mysterious masked warrior appears! 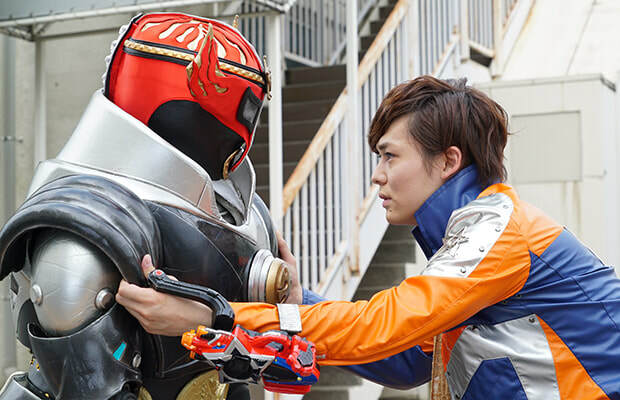 Episode title and summary for the 34th episode of Uchuu Sentai Kyuranger now up! "After acquiring a new battle ship, the Kyurangers are preparing for a battle to attack the Jark Matter Organization head-on and all that they need now is the information regarding the enemy's location. Kukuruga once again shows himself and this time, bring's Champ's evil prototype that is built for assassination duties and the Kyurangers are having a hard time fighting something that looks like their comrade when a masked warrior appears! Is he friend or foe?"